Cradled between the Torch and the North Saskatchewan Rivers and nestled against Saskatchewan’s beautiful northern boreal forest, Choiceland is the largest community in the geographical triangle between Nipawin, Prince Albert and Melfort. 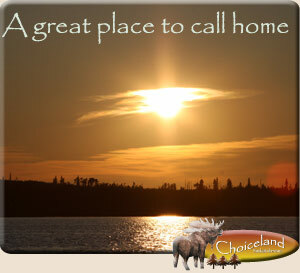 This location puts Choiceland within an easy drive, on paved highways, from four Regional Parks – Wapiti to the south, Nipawin to the east, Narrow Hills and the historic Hanson Lake Road to the north and Candle Lake Resort and Forest Preserve to the west. Travel north through the town along a well marked all-weather road and you link up with Highway 106. There you enter a vast, unspoiled land of virgin forest and clean pristine lakes. We have all the advantages of small town living with ready access to the amenities of larger centers. We freely boast about our clean and abundant water, our picturesque scenery, majestic trees and our safe and friendly town atmosphere. 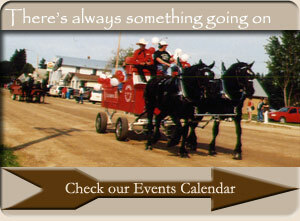 We offer the relaxing, and peaceful lifestyle associated with small town living. The rich agricultural land surrounding Choiceland provides for our main industry of farming. Our northern location and weather allows us to produce some of the best quality cereal grains, pulse and grass crops in the world. We are also within 15 km of a rich kimberlite deposit within Forte ale Corne Forest Preserve. Logging, lumber, tourism, hunting and fishing provide additional sources of industry and economy. Our thriving business community offers a full range of retail, transportation, construction and agricultural businesses and services. We are very proud of our Torch River Railway; owned and operated locally that provides a valuable transportation service to the farmers of the area. We have approximately 25 craft and home based businesses. Local volunteers are very active and support the success of the services in our community. Their time, effort and expertise provide our community with ongoing cultural, educational, and recreational events and activities for all our citizens throughout the year. The town supports a K – 12 school, two active churches, a large library, a historical museum, two town halls, a Senior Citizens Association, Senior Housing complex, various youth groups, and a OORP service groups. We have a fully equipped fire hall and volunteer fire department.